My wife had Spring Break last week (she is a 3rd grade teachers). I had two days of meetings in Chicago. What that meant was a half vacation/half work week. It was the first time in four years that my wife had been back to Chicago. We were booked wall to wall with friends and events. It was a great week to see people and relax with my wife. However, I didn’t read squat. So I am at a point where I really am not finished with any of the books I am reading. 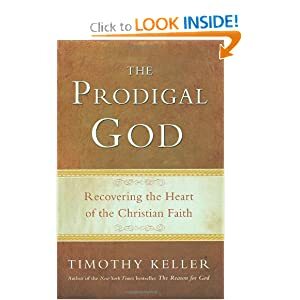 I am close to finished with Prodigal God by Tim Keller. (71% as I am typing this late Tuesday night.) Although this book suffers from the “probably could be a long magazine article” problem, it really is a good book. As he works around the subject of the story of the Prodigal Son from a variety of vantage points I find myself looking at the story in a new light. Tough work for one of the most known passages of scripture ever. I have not finished it, but I saw this passage on a blog I was reading last week. I honestly am not sure where I found it. I thought it was on Jesus Creed blog, but I couldn’t find it. So thank you someone for blogging this passage. This really is the heart of the book. “What must we do, then, to be saved? To find God we must repent of the things we have done wrong, but if that is all you do, you may remain just an elder brother. To truly become a Christian we must also repent of the reasons we ever did anything right. Pharisees only repent of their sins, but Christians repent for the very roots of their righteousness, too. We must learn how to repent of the sin under all our other sins and under all our righteousness – the sin of seeking to be our own Savior and Lord. We must admit that we’ve put our ultimate hope in both our wrongdoing and right doing we have been seeking to get around God or get control of God in order to get hold of those things.